The M18 FUEL < inch Impact Driver is the Fastest, Most Compact, and Most Powerful tool in its class. The POWERSTATE Brushless motor delivers up to 2,000in-lbs of torque and up to 30% Faster Driving speed, increasing users productivity for the most demanding fasteners on the job. With the Most Compact tool at only 4.59 inch in length, users will have more access in tight spaces. The REDLINK PLUS intelligence ensures maximum performance and protects from overloads, heating or over-discharge. The REDLITHIUM Battery Pack (not included) delivers more work per charger and more work over the life of the pack than competitors. The 4-Mode DRIVE CONTROL provides greater control over output speed and power for greater versatility. Self-Tapping Screw mode provides faster installation time by reducing stripping of fasteners. The DEWALT DCF887M2 Impact Driver features a DEWALT built brushless motor and XR Lithium-Ion batteries that deliver more run time and capacity over standard units. This driver is designed with 3-speed settings for optimized application versatility. This 20V MAX Compact Brushless Impact Driver Kit includes one 20V MAX Lithium Ion Battery, one charger, and carrying bag. At only 5.1 -inch front to back, the Impact Driver features a high performance brushless motor that delivers 1700 in-lbs of torque and 3 LED lights to provide optimum illumination in dark spaces as you work. For increased comfort, the handle features an ergonomic design for balance and easier tool control along with a removable belt hook. Backed by a DEWALT 3-year limited warranty so you can buy with confidence. M18 FUEL 18-Volt Lithium-Ion Brushless Cordless 1/4 inch Hex Impact Driver (Tool-Only) The M18 FUEL < inch Impact Driver is the Fastest, Most Compact, and Most Powerful tool in its class. The POWERSTATE Brushless motor delivers up to 2,000in-lbs of torque and up to 30% Faster Driving speed, increasing users productivity for the most demanding fasteners on the job. With the Most Compact tool at only 4.59 inch in length, users will have more access in tight spaces. The REDLINK PLUS intelligence ensures maximum performance and protects from overloads, heating or over-discharge. The REDLITHIUM Battery Pack (not included) delivers more work per charger and more work over the life of the pack than competitors. The 4-Mode DRIVE CONTROL provides greater control over output speed and power for greater versatility. Self-Tapping Screw mode provides faster installation time by reducing stripping of fasteners. M18 FUEL 18-Volt Lithium-Ion Brushless Cordless 1/4 inch Hex Impact Driver (Tool-Only) is rated 4.6 out of 5 by 80. Rated 5 out of 5 by Izzy from The DRILL to BUY. Awesome drill, purchased it to replace... The DRILL to BUY. Awesome drill, purchased it to replace my older impact. This one is more compact, smarter, and stronger then the competition. Invest in this drill. Rated 5 out of 5 by HomeDepotCustomer from It works. I like it.... It works. I like it. Rated 5 out of 5 by Ken from Really sinks the screws good!... Really sinks the screws good! Rated 5 out of 5 by Bullet from Fast fast fast......lightweight and very small. It's a Milwaukee...... It's a fuel.....enough said! 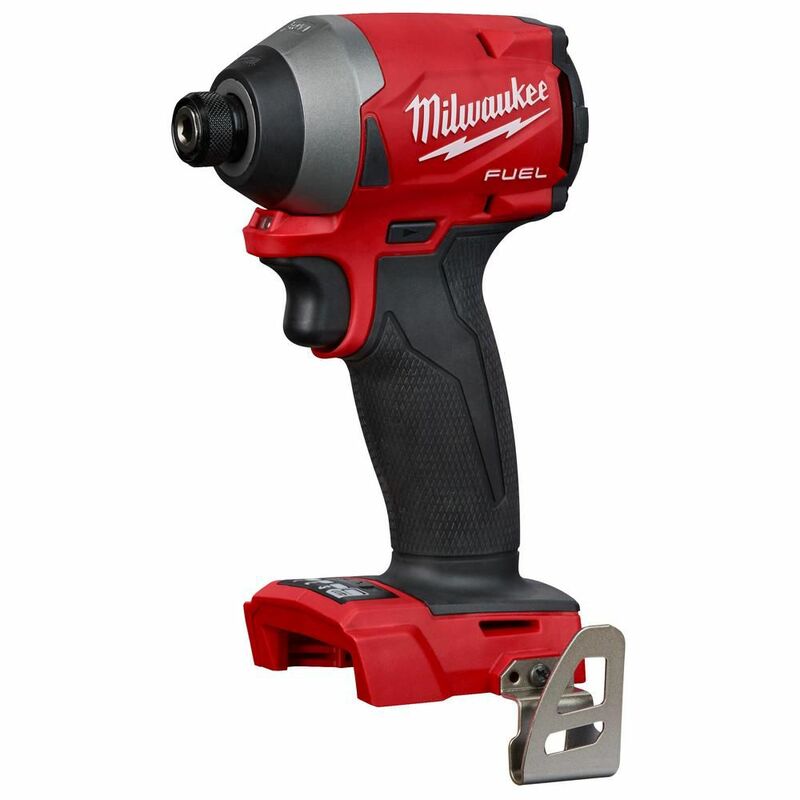 The small size is superb it's fast with multiple speed settings.... Milwaukee all the way! Need something compact and strong enough for lug nuts. Up to 150lbs or so. Any idea if I can use a 1/4 or is it a must and still have to lug around a 1/2 inch drive still? Hi Eric, I would suggest our compact impact wrench (2755-20). This tool delivers up to 220 ft-lbs of torque, enough power for lug nut removal.